Peter at the Primal Twang concert. This is the story of my experience being part of a theatrical journey exploring the legacy of the guitar starting with early folk roots, through classical, flamenco, Elvis, jazz, samba, and ending with full blown rock guitar. In September, 2006 I was fortunate to be part of a music production called Primal Twang. It was a theatrical journey exploring the legacy of the guitar starting with early folk roots, through classical, flamenco, Elvis, jazz, samba, and ending with full blown rock guitar. 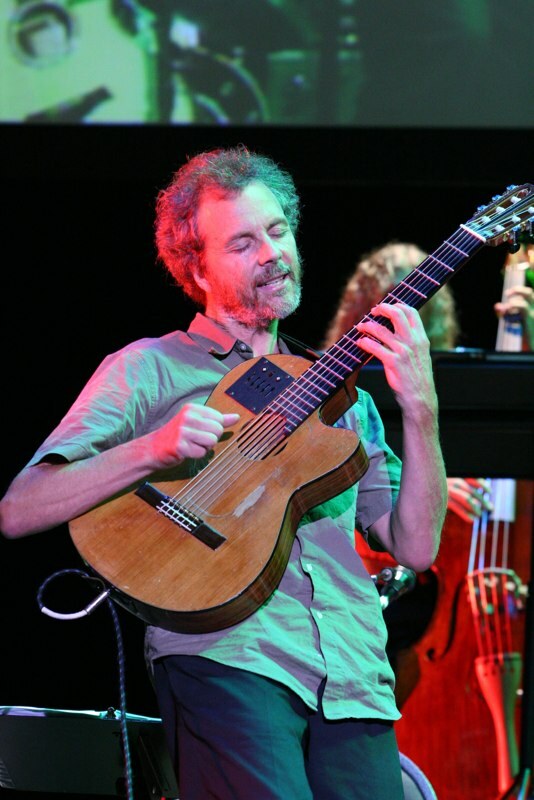 Acclaimed guitarist Dan Crary was the storyteller weaving his tales connecting each of the musical eras and performances. Here is the announcement for the show and the list of the incredible musicians involved. The ride was inspired and hearing all of the different players and the world’s that they live in was a glimpse into how many unique approaches can be taken towards making the six strings make music. We rehearsed a ton for the show, had a lot of fun meals together and backstage pranks, and then pulled off 4 stellar performances to ultra packed houses. The whole production was filmed and recorded for a DVD release set for the upcoming future. Check out the images and I’ll let you know when the DVD comes out. Click here to take the visual tour.